October 28, 2015 – NASA astronauts Scott Kelly and Kjell Lindgren ended their spacewalk at 1:19 p.m. MDT with the repressurization of the U.S. Quest airlock, having completed most of the major tasks planned for their excursion outside the International Space Station. 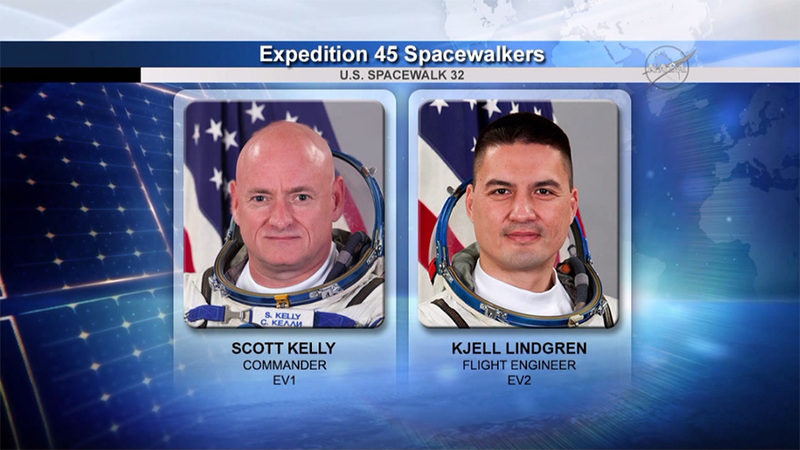 Kelly and Lindgren will venture outside the International Space Station again on Friday, November 6. The two spacewalks were scheduled around milestones in space. Tomorrow, Kelly becomes the U.S. astronaut who has lived in space the longest during a single U.S. spaceflight, and Monday the crew celebrates the 15th year of a continuous human presence in space aboard the station. During the second spacewalk, the astronauts will restore a truss cooling system to its original configuration following a 2012 spacewalk in which another team of astronauts attempted to isolate a leak of ammonia coolant. They also will top off ammonia on the station’s truss reservoirs. NASA Television coverage will begin at 3:45 a.m. MST ahead of the spacewalk’s planned start time of 5:10 a.m.
Lindgren is a graduate of the U.S. Air Force Academy in Colorado Springs and Colorado State University in Fort Collins. Lindgren received his medical degree from the University of Colorado Boulder. This was the first spacewalk for both Kelly and Lindgren and the 189th in support of space station assembly and maintenance. This is NASA’s 32nd spacewalk to service the space station.